"With days to go, Sylvia Garcia aims to avoid runoff in Houston congressional race" was first published by The Texas Tribune, a nonprofit, nonpartisan media organization that informs Texans — and engages with them — about public policy, politics, government and statewide issues. HUMBLE — State Sen. Sylvia Garcia didn't have much of an entourage with her as she knocked on doors in the final stretch of her bid for the Democratic nomination in Houston's 29th Congressional District. In fact, it was downright old-fashioned: A single staffer tagged along with yard signs as an old friend drove her around his stomping grounds in his Chevy Blazer, introducing her to his neighbors. A rally would come later in the day, and campaign volunteers were also canvassing the district, but for now this was a remarkably intimate campaign moment, particularly given that old friend helping her was the seat's retiring congressman, Gene Green. As they approached people's porches, Garcia tossed newspapers up from their lawns. Green assessed every house for where to best place one of Garcia's campaign signs. He's particularly focused on endearing himself to residents of corner houses because those offer two different angles for sign placement. Instead of fancy campaign apps on their phones, the pair used printed sheets and clipboards. "I'm old school...Gene and I like to do it this way," said Garcia. "Any campaign worth its salt has a clipboard somewhere." They've done this a time or two before, it seems, and the experience is always a window into humanity. One man asked the pair to wait a few minutes so he could put on his pants. Another man jokingly shouted at Garcia as she walked away to "behave yourself!" Garcia and Green ran against each other in 1992 for the seat Green eventually won. Two years ago, Garcia gave him political cover when he came under threat from a primary challenge. Now Green is campaigning for Garcia like his own career depends on it. Months ago, Garcia appeared poised to easily win this race, but something happened along the way to the nomination: Out of nowhere, health care executive Tahir Javed declared his candidacy for the seat and has, so far, raised $1.2 million, most of it his own money. Garcia is widely expected to take first place here on Tuesday, but the operative question is whether she will win by enough to avoid a runoff. "We're still confident we can get out of this without a runoff," she said. "It's a crowded field but we've worked it really hard." The 29th District has a largely Hispanic population. First drawn in 1992, it was expected that it would be represented by a Hispanic. But through his retail politicking skill, Green, who is white, easily won re-election year after year. The district stretches from Humble, where Garcia and Green were blockwalking, around the east side of Houston and down into Pasadena where, on the same afternoon, Javed hosted a campaign event in which he and his supporters gave away free items to people in front of an abandoned Macy's department store. Tejano music blared as a long line of people waited with boxes to collect canned food, cereal and even mattresses. A drone camera buzzed above for future campaign videos. "I'm a realistic guy," said Javed. "For me, straight win, I should not even talking about. It's a runoff." "My target is, we walk out of runoff as number one candidate," he added. He added that he hopes to come in first place Tuesday within the sprawling Democratic field. Beyond Javed and Garcia, several other candidates are running for the seat: businesswoman Dominique Garcia, attorney Roel Garcia, educator Hector Adrian Morales, veteran Augustine Reyes and small business owner Pedro Valencia. All have raised under $60,000, but they could collectively keep the majority of the vote out of Sylvia Garcia’s grasp. Javed told the Tribune earlier this year he would “spend whatever it takes” to win this seat. That sum is now at least $800,000. When asked about critics who have accused him of trying to buy the seat, he said, "It's very unfortunate that without spending money, you cannot take your message to people. I wish there was a way you could do that." "Now I'm not a real politician who has name I.D. out there, so I had to put my name out," he added. "To do that, it costs money." Garcia has raised about $500,000, and EMILY’s List, the influential national group that helps elect Democratic women who support abortion rights, spent about $60,000 after early voting began on digital and other media for her. Senate Minority Leader Charles Schumer of New York endorsed Javed just as early voting began. It was widely perceived as a nod to the extensive fundraising Javed has done over the years for the party — but it nonetheless enraged many Texas Democrats, including Green. "Chuck ought to stay out of our business," Green said. "I cannot imagine Chuck Schumer influencing one vote in our district." "I’ve made my choice,” said Gillibrand when recently asked by The Texas Tribune about the split with her senior senator. The other reason this race matters beyond the district is that Garcia could become the first Latina elected to Congress from Texas. This year, she could also be among the first class of Texas women elected to a full term in Congress since 1996. Garcia has long dismissed Javed's spending, suggesting her relationships in the district will carry the day. Some of that was on display as she and Green knocked on doors. Every third house or so, the occupant knew exactly who they were. In one house, an older woman screeched "Sylvia! Gene!" when she saw the pair. The woman's daughter rushed an even younger girl out of the house to take a photo with Garcia and Green in front of a Garcia campaign sign. The sense among most Houston Democratic insiders is that the combination of the large field and Javed's spending are likely to be too much for Garcia to overcome on Tuesday, meaning a runoff is likely. But, eventually, many expect that her decades of time in Houston politics will carry the day and she will win this race – eventually. With days to go, Sylvia Garcia aims to avoid runoff in Houston congressional race By Abby Livingston March 3, 2018 HUMBLE — State Sen. Sylvia Garcia didn't have much of an entourage with her as she knocked on doors in the final stretch of her bid for the Democratic nomination in Houston's 29th Congressional District. In fact, it was downright old-fashioned: A single staffer tagged along with yard signs as an old friend drove her around his stomping grounds in his Chevy Blazer, introducing her to his neighbors. A rally would come later in the day, and campaign volunteers were also canvassing the district, but for now this was a remarkably intimate campaign moment, particularly given that old friend helping her was the seat's retiring congressman, Gene Green. As they approached people's porches, Garcia tossed newspapers up from their lawns. Green assessed every house for where to best place one of Garcia's campaign signs. He's particularly focused on endearing himself to residents of corner houses because those offer two different angles for sign placement. Instead of fancy campaign apps on their phones, the pair used printed sheets and clipboards. "I'm old school...Gene and I like to do it this way," said Garcia. "Any campaign worth its salt has a clipboard somewhere." They've done this a time or two before, it seems, and the experience is always a window into humanity. One man asked the pair to wait a few minutes so he could put on his pants. Another man jokingly shouted at Garcia as she walked away to "behave yourself!" Garcia and Green ran against each other in 1992 for the seat Green eventually won. Two years ago, Garcia gave him political cover when he came under threat from a primary challenge. Now Green is campaigning for Garcia like his own career depends on it. "Sylvia's gonna follow in my foot steps," Green told a couple working in their yard. "Somebody joked that she couldn't get in my boots and I said I'll never wear her high heels.' Months ago, Garcia appeared poised to easily win this race, but something happened along the way to the nomination: Out of nowhere, health care executive Tahir Javed declared his candidacy for the seat and has, so far, raised $1.2 million, most of it his own money. Garcia is widely expected to take first place here on Tuesday, but the operative question is whether she will win by enough to avoid a runoff. "We're still confident we can get out of this without a runoff," she said. "It's a crowded field but we've worked it really hard." The 29th District has a largely Hispanic population. First drawn in 1992, it was expected that it would be represented by a Hispanic. But through his retail politicking skill, Green, who is white, easily won re-election year after year. The district stretches from Humble, where Garcia and Green were blockwalking, around the east side of Houston and down into Pasadena where, on the same afternoon, Javed hosted a campaign event in which he and his supporters gave away free items to people in front of an abandoned Macy's department store. Tejano music blared as a long line of people waited with boxes to collect canned food, cereal and even mattresses. A drone camera buzzed above for future campaign videos. "I'm a realistic guy," said Javed. "For me, straight win, I should not even talking about. It's a runoff." "My target is, we walk out of runoff as number one candidate," he added. 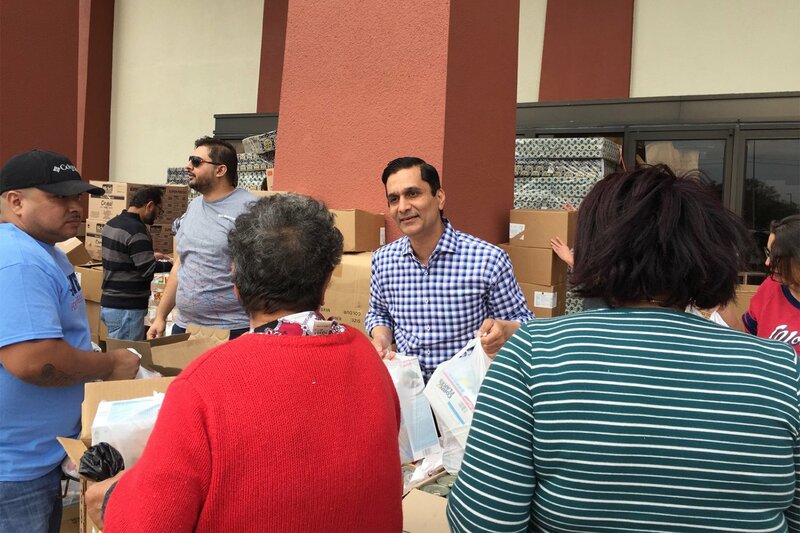 Health care executive and congressional candidate Tahir Javed hands out food in Pasadena on Saturday, March 3, 2018. Abby Livingston/Texas Tribune He added that he hopes to come in first place Tuesday within the sprawling Democratic field. Beyond Javed and Garcia, several other candidates are running for the seat: businesswoman Dominique Garcia, attorney Roel Garcia, educator Hector Adrian Morales, veteran Augustine Reyes and small business owner Pedro Valencia. All have raised under $60,000, but they could collectively keep the majority of the vote out of Sylvia Garcia’s grasp. Javed told the Tribune earlier this year he would “spend whatever it takes” to win this seat. That sum is now at least $800,000. When asked about critics who have accused him of trying to buy the seat, he said, "It's very unfortunate that without spending money, you cannot take your message to people. I wish there was a way you could do that." "Now I'm not a real politician who has name I.D. out there, so I had to put my name out," he added. "To do that, it costs money." Garcia has raised about $500,000, and EMILY’s List, the influential national group that helps elect Democratic women who support abortion rights, spent about $60,000 after early voting began on digital and other media for her. The race, oddly, has drawn the attention of two well-known New Yorkers. &nbsp; Senate Minority Leader Charles Schumer of New York endorsed Javed just as early voting began. It was widely perceived as a nod to the extensive fundraising Javed has done over the years for the party — but it nonetheless enraged many Texas Democrats, including Green. Green used to serve with Schumer when the New Yorker was in the U.S. House. "Chuck ought to stay out of our business," Green said. "I cannot imagine Chuck Schumer influencing one vote in our district." But Schumer’s fellow Democratic New York senator, Kirsten Gillibrand, also got in the game and donated to Garcia’s campaign. "I’ve made my choice,” said Gillibrand when recently asked by The Texas Tribune about the split with her senior senator. The other reason this race matters beyond the district is that Garcia could become the first Latina elected to Congress from Texas. This year, she could also be among the first class of Texas women elected to a full term in Congress since 1996. Garcia has long dismissed Javed's spending, suggesting her relationships in the district will carry the day. Some of that was on display as she and Green knocked on doors. Every third house or so, the occupant knew exactly who they were. In one house, an older woman screeched "Sylvia! Gene!" when she saw the pair. The woman's daughter rushed an even younger girl out of the house to take a photo with Garcia and Green in front of a Garcia campaign sign. The sense among most Houston Democratic insiders is that the combination of the large field and Javed's spending are likely to be too much for Garcia to overcome on Tuesday, meaning a runoff is likely. But, eventually, many expect that her decades of time in Houston politics will carry the day and she will win this race – eventually. Read related Tribune coverage 11 Texas congressional primary races to watch Why is Texas voter turnout so low? Demographics play a big role Immigration, GOP dollars dominate Democratic primary to replace U.S. Rep. Beto O'Rourke "With days to go, Sylvia Garcia aims to avoid runoff in Houston congressional race" was first published at by The Texas Tribune, a nonprofit, nonpartisan media organization that informs Texans — and engages with them — about public policy, politics, government and statewide issues. Link back to the original article, which is located at https://www.texastribune.org/2018/03/03/can-sylvia-garcia-avoid-runoff-race-us-rep-gene-greens-seat-houston/.